Florida Gators spring football is not for the faint of heart. It may have been that way the last few years, but Dan Mullen and his coaching staff are bringing accountability back to the University of Florida. The first practices of the spring have given a glimpse of that. From players redoing a drill for making mistakes as small as a toe pointed in the wrong direction to extra conditioning for mental lapses like offside penalties. Nothing less than the best effort and attention to detail is acceptable. Co-offensive coordinator and wide receivers coach Billy Gonzales gave a little more insight into the measures the new staff is taking following Tuesday’s practice. It turns out grades aren’t just for the classroom anymore. This is not like any typical grade school report card. It’s more like you failed your math test, and now your teacher is holding it up for the entire class to see. The grades aren’t all performance-based. After all, this team has only endured three full practices with its new coaches. A lot of what is expected of players right now is based on learning how to practice the right way. Once the learning process is over, nothing below that level will do. There are no participation trophies. Everything is a competition. And come fall, there are only a certain number of spots on the field for the taking. 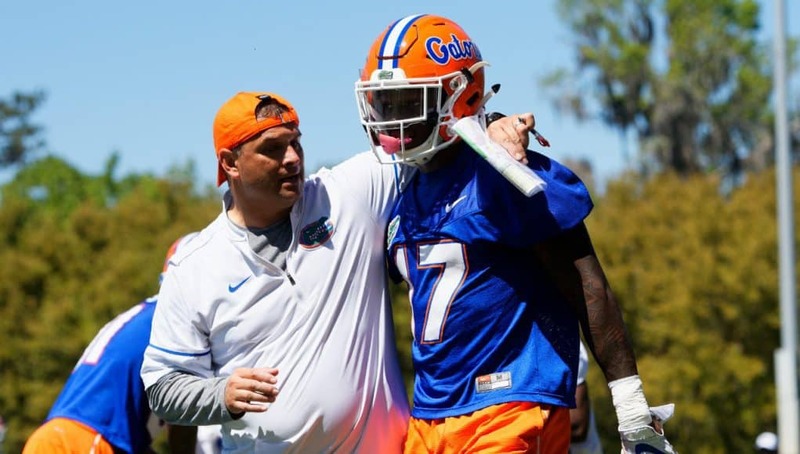 Mullen has talked about the Florida standard countless times since he became head coach of the Gators, and this grading system, along with many other accountability methods, is a start towards bringing this program back to that. It’s not going to rise from the ashes in a day, or even a year, but all good things take some time.